The 2019 VGC World Championship Series is the second utilising Pokémon Ultra Sun & Ultra Moon games and adopts the GS Cup format once more, allowing for players to use two restricted Legendary PokÃ©mon. With this, the series, for the first time, is set into three different series each with restrictions. First bans all Mega Evolutions, Primals and Z-Moves, second bans all Mega Evolutions, Primals and Ultra Necrozma and the third allows for everything. 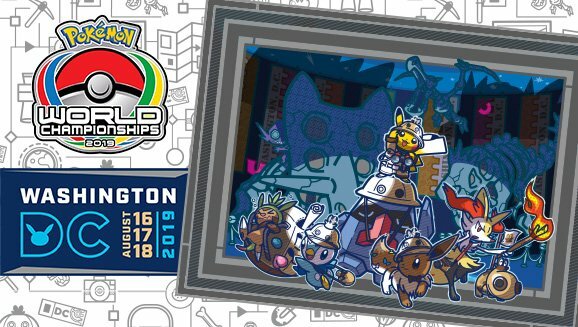 The 2019 World Championships are to be held in Washington D.C.
Pokémon Limits: Teams may have no more than two of the following Pokémon: Mewtwo, Lugia, Ho-Oh, Kyogre, Groudon, Rayquaza, Dialga, Palkia, Giratina, Reshiram, Zekrom, Kyurem, Xerneas, Yveltal, Zygarde, Cosmog, Cosmoem, Solgaleo, Lunala & Necrozma. Throughout the Play! Pokémon series, there were numerous online competitions that will give CP to players if their Play! Pokémon account is linked to their Organised Play ID. The CP is organised to the top 256 players worldwide, regardless of region. Name Date Entry Gift CP Given? Premier Challenges are small competitions dotted around the various countries in the world. These competitions typically happen once a month or so depending on the organisers and can provide a small amount of CP which can then be used to help participate in the Worlds Championships. Regional Championships are set up across the world, mostly in North America, to provide small competitions beyond the Premier Challenges to allow for players to earn CP. There are a number of Regional competitions each year and they all follow the standard format. They often have side events for all players. Name Location Country Date Distribution Pokémon Streamed? Following the removal of the National Championship Series, four special Championships are to be held. These will get special points akin to that of Nationals and high prize payouts. The World Championships are where the best of the world come to participate and fight it off to become World Champion. Participation in the events is by invitation based on CP.